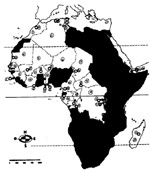 This series of tasks, the first portion of a unit on African civilizations (that was developed during the Immersion 101 Institute last summer), presents the geography and basic statistics of French-speaking Africa. Students are not expected to have a great deal of previous experience with these countries. Instead, these tasks help students realize the vitality and diversity of French-speaking countries in Africa. All instruction, writing, and student interaction should take place solely in French. I use it with my seventh- and/or eighth-grade non-immersion students who have had two to three years of beginning French study, but it is adaptable to upper level immersion classrooms. In this task, the teacher introduces the geographical terms used in reading and describing maps (to the north of, next to, near to, on the coast of, between, etc.) and the names of major French-speaking countries in Africa. To introduce the geographical terms, the teacher draws an imaginary map on the whiteboard, using countries and large bodies of water named after the students. Naming the countries after the students keeps the students engaged and focused. The teacher then demonstrates how to describe the countries÷ relative positions, using the country1-verb-preposition-country2 structure (Pierrepays is to the north of Chantalorie.). Students are then called upon to describe the location of countries relative to one another. The students work in pairs for this task, with the teacher circulating to observe and help. Each pair will be given two papers: a map and a page of clues. Each student should also have a pencil and blank paper. "The big country in the north of Africa is Algeria." Student B then finds Algeria on the unmarked map, labels it, and says Algeria÷s number to Student A. Student A then records the number and the country on the blank paper. The students continue their roles through all the clues, until every French-speaking country is labeled on the map and recorded on the blank sheet. Subsequent hints can identify countries by their physical relationship with previously-identified countries. When the students complete the exercise, the teacher collects their papers to be redistributed the next day. Students each receive a table handout with the columns labeled Country, Density, Religions, Languages, Regime, Date of Independence, and Resources. After introducing the table, the teacher instructs the students to brainstorm words that fit in these categories. The students first work in small groups, then share their results while the teacher records on the whiteboard or overhead. The students then go to the computer lab, navigating a web browser to the website. They could also use a similar site in French which lists basic facts about African countries. On the table handout, they research and record the information about the countries they discovered in Task 2. As each student finishes, they are paired with another finished student to compare their answers. Once the research is done, the students return to the classroom to work again in small groups. They should compare their results and find patterns. When the teacher judges that each group has finished, he/she collects the charts to be assessed. These activities are assessed through a combination of student self evaluation and teacher observation. Students are directed in their self evaluation to assess how much, how quickly, and how well they understood the tasks that they were asked to perform. They are questioned about their own ability to work through confusion or frustration as well. The teacher evaluates the items discussed above, as well as the student÷s participation in class, their linguistic and factual accuracy, and their attitude toward the challenges they faced. No matter how much small-group work and preparatory brainstorming I use with my students, there are always those students who, when faced with a page of French clues or an unfamiliar French website, either ask me repeated questions, find a way around doing the exercise properly, or (rarely) shut down. I have learned to expect these reactions, although the small-group work and preparatory brainstorming do reduce the incidents of this sort. I have found it most useful to be patient and available, but not overeager to help.